•	Precast-IT! is an acronym for “Precast Information Technology.” Precast-IT! is believed to be one of the most advanced management applications of information technology in the precast industry. •	Want a quality solution? Then, precast it using an NPCA certified plant! Precast-IT! makes it possible to provide the best possible products at the lowest possible prices. By tracking inventory levels on a daily basis with 99.99% error free mistakes means that we know what to produce and when. By having an Inventory Management System that maintains a record of raw material characteristics, concrete cylinder breaks, inventory levels and age of each product line in stock, to the time, date, and delivery specialist who delivered the product eliminates product defects and keeps inventory levels low. This means we don't require large inventory levels and are able to deliver certified product just-in-time for your project. This passes the savings on to you. Currently, Barger & Sons, Inc. is the only precast concrete company in the United States that utilizes a Precast-IT! for their Inventory Management System. •	Entry of test data for every batch of concrete. •	Use of bar codes to provide a serial number for every component manufactured and every assembled tank, an identifier for each employee, an identifier for each delivery, and for each customer invoice. •	Detailed information for every precast product, including description, size, the form used for manufacture, date manufactured, applicable state standards, water and vacuum test date and results, current inventory status, description of any required repair actions, and a section for general notes about the product. •	Rapid “assembly” of tanks by selecting precast components from a pick list. •	Inventory tracking of all precast components and assembled tanks. •	Inventory tracking of “commodities,” which may include any bulk items that are tracked by quantity rather than serial number. •	Delivery tracking of both serialized precast products and commodities. System tracks date and time each precast product is loaded on a delivery truck as well as who loaded it. Truck departure date and time, as well as arrival date and time at the customer site, is also tracked. Finally, unload date and time for each precast product is tracked, together with who unloaded each product. Almost all data entry associated with deliveries is performed by simply scanning barcodes. The only keyboard data entry is quantity of commodities loaded and unloaded. Inventory status of precast products, as well as commodity quantities, is automatically updated as a result of customer deliveries. •	Tracking of truck fuel consumption and mileage, with one-button export to a spreadsheet for further analysis. •	Products picked up at the plant by a customer are tracked in a manner similar to deliveries with automatic update of inventory status and quantities. •	One-button uploading of barcode transactions, as well as one-button initialization of barcode readers, facilitates ease of use by workers with minimal computer skills. •	Precast-IT! was developed using Microsoft Access® and Microsoft Visual Basic® to implement a networked, multi-user data base application supporting simultaneous use by manufacturing and management personnel. •	The data base includes 28 discrete tables; of these, 8 tables are used to support uploading of transactions from the bar code reader. •	Precast-IT! runs on a PC with Windows XP® or on an Intel-based Mac that has Windows XP installed in a dual-boot configuration. 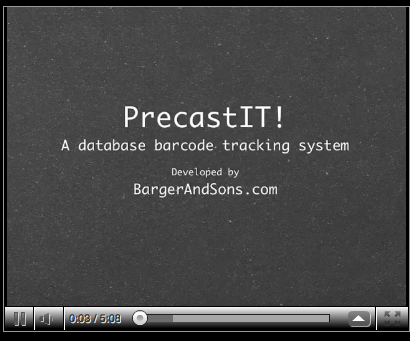 •	Barcode readers used by Precast-IT! are Unitech Model PT-630D Portable Data Terminals with integral long-range laser scanners. Because of the size of many precast tanks, long-range laser scanners were considered essential to worker safety by eliminating any proximity requirement for using the readers. Selecting the barcode readers was one of the most challenging aspects of the project. A precursory review of available bar code readers revealed an overwhelming selection of available readers in the marketplace. Programming of the available readers ranged from difficult and cheap to easy and expensive. The developer contacted Mr. Al Fortuner, Sales Manager for National Barcode, Inc. in Mertztown, Pennsylvania. Mr. Fortuner sells barcode readers from many vendors and is quite familiar with available vendor offerings. After asking the developer a few probing questions, Mr. Fortuner quickly recommended the Unitech PT-630D. A major driver was the developer’s desire to have a reader that could be easily programmed for the precast application without purchasing an expensive software development tool. Mr. Fortuner provided a download link for Unitech’s free barcode reader software development tool that enables development of user applications by drawing flowcharts on the screen and entering a few parameters. Similar applications from other barcode reader manufacturers may cost as much as several hundred dollars. The developer was able to download the Unitech software, develop a working precast application, and validate the application using an included simulator in about four hours before actually purchasing the Unitech hardware. •	Precast products are stored, transported, and installed in adverse environmental situations. A special label with quick adhesion characteristics and long-term durability was a must for optimum results. After evaluating several options, Brenda Zetelski with Data Collection Specialist, Inc. in Conroe, Texas, won the bid with their quick-stick labels, Citizen CLP-7201e Barcode Label Printer, and Label Matrix software combination. The labels are easily and quickly printed. Plant personnel then apply the labels to precast products immediately after they are removed from the form.